Want to create a native habitat? Learn more with the Florida Fish & Wildlife Commission. Order a 'Native Plant Garden' sign and review native plants in the whole yard, not just on the lakeshore. Diagrams, planting guides, and more. All you could ever need to start a re-vegetation project! Each garden is designed specifically to further one mission: inspire visitors to appreciate and understand plants. 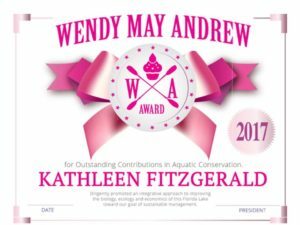 We're proud of Kathleen Fitzgerald for earning the Wendy May Andrew award for Outstanding Contributions in Aquatic Conservation!